The island is not ready to topple into the sea yet! For many years, I heard the old urban legend repeated as fact by many Cozumeleños that the island of Cozumel was sitting on a champagne-glass (“copa”) shaped pedestal, hidden under the sea. It always amazed me how many people believed and retold this story as the gospel truth. Once, there was a near riot when panicked islanders became irrationally concerned with some blasting that a construction company was doing. The folks in the neighborhood were whipped up into a wild-eyed frenzy over fears of what would happen if the tremors from this blasting would fracture the “stem” that was supposedly supporting the island. They were all worried that the island would tip over and fall beneath the waves! A possible origin for this weird belief could have been the wave-eroded limestone formation that was once located at Punta Morena, on the east coast of Cozumel. People may have believed the island was similarly eroded from below. The Punta Morena formation, known as “La Copa,” eventually fell over in a storm. I am sure the island will not suffer a similar fate. 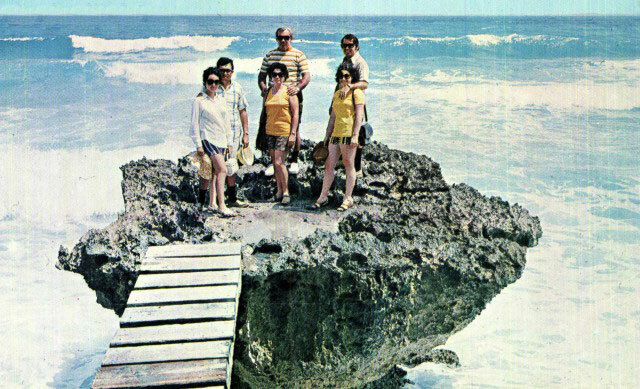 There is an interesting relationship between limestone, freshwater, saltwater and erosion that shows how the “La Copa” that once stood at Punta Morena was formed. As fresh water in the form of rain percolates through the porous limestone surface of the island, it collects in fracture lines in the limestone and trickles down to the level of the saltwater table underground. The freshwater then stops its downward movement and floats atop the much denser and heavier saltwater. 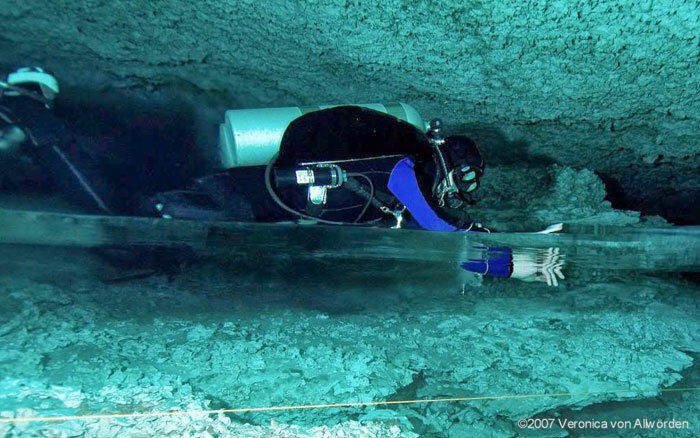 Cave divers can see this saltwater/freshwater interface (called a halocline) quite readily. These two, separate and unmixed layers of waters move together as one, making their way slowly towards the sea though the fractures and cracks in the limestone bedrock. Over thousands of years, this moving water erodes away the exposed surfaces of these fissures, enlarging them so that they become tunnels, or caves. These two, sandwiched-layers of water have different maximum capacities of dissolved limestone (calcium carbonate) that they can carry. As both layers reach their respective saturation points, chemical erosion of the tunnel slows down considerably. However, when this slow-moving “sandwich” of fresh and saltwater meets the sea at the end of the tunnel, a new chemical process begins. In this “mixing zone,” the two, separate, layers of fresh and salt water are combined into one brackish layer by the actions of the waves at the shoreline. This brackish water has a higher capacity of carrying dissolved calcium carbonate. So it is here, in the mixing zone at the mouth of the tunnel, that chemical erosion begins anew, as the sub-saturated brackish water attempts to reach a saturated equilibrium by taking in more calcium carbonate, thus causing accelerated erosion at the mouth of the tunnel. As the tunnel mouth erodes more and more, the roof of the cave becomes thinner and thinner. Eventually, the roof near the mouth collapses, forming a rubble-filled “caleta,” or small bay. The physical erosion by waves eventually destroys this rubble-field while the brackish mixing zone has retreated farther inland to the location of the new cave mouth. This chemical erosion, which causes roofs to collapse at the mouth of caves, is the origin of the many caletas in Quintana Roo. Caleta marina on Cozumel, or Xcaret and Xelha on the mainland are prime examples of this process of chemical erosion. Nevertheless, this erosion process is limited geographically to the mouths of caves and won’t cause Cozumel to topple over into the sea!